Here are a son and his father surviving their worst nightmare. Being in a wildfire and barely escaping with their life. You can’t make this stuff up and it was all caught on a dash cam in their Subaru Legacy sedan. It happened when a fire sparked by lightning set off a massive forest fire taking hikers and campers by complete surprise in Montana’s in Glacier National Park. In a report by WHDH News, Justin Bilton told them he and his father were on a backpacking trip in Glacier National Park last week and were informed by park rangers of the possibility of lightning storms. After setting up camp at Lake McDonald, they noticed an ominous cloud of smoke getting closer. Lightning had struck, and the Howe Ridge Fire was off and running. "I just had a bad feeling about it, and I was like ‘Dad, I think we need to get out of here,'" Bilton told the news station. The video below shows the father and son driving a Subaru Legacy trying to escape the flames on the dirt road leading out of the camping spot. They drive through walls of flames shooting up and across the road. As the flames shoot up around the car, Justin asks his dad, “What if the car blows up?” His father's response is ominous. “Well, we're dead. Just keep driving.” Unfortunately, they drive right into the heart of the fire and a burning log blocks the Subaru’s path. The father insists on getting out and moving the log himself. Bilton finally drops the camera and pleads with his father to stay in the car as the feed goes to black and then cuts out entirely. The son convinces his father to stay in the car and the two managed to somehow reverse the Subaru Legacy all the way up the path and run to the lakeshore, where they miraculously flagged down a Park boat and escaped to safety. Bilton told WHDH, ten minutes after they escaped, the entire forest was on fire, incinerating their campsite and the Subaru Legacy. 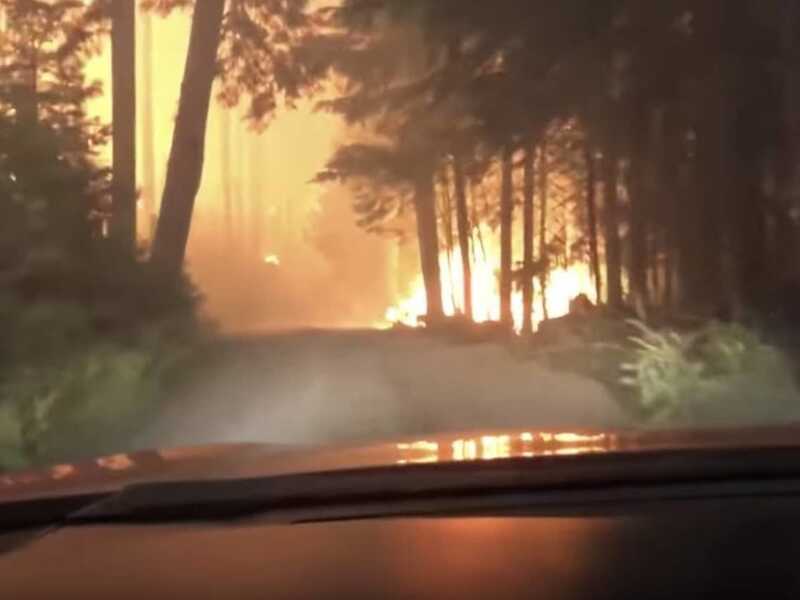 Watch Father and son drive through flames to escape forest fire video.